Blog Hoppin': Let's Celebrate Fall! Hi everyone, it's Amy from The Resource(ful) Room! I am so excited to share some fall fun with all of you! I love Fall! It's such a beautiful time with all the colors and perfect weather! I you enjoy teaching fall themes too. Apples, leaves, pumpkins, and scarecrows, Halloween and Thanksgiving! We all love fall, so we decided to put together a little treat for all of you! Join us for the next several days as we feature our favorite fall products! Today I"m sharing my favorite product for celebrating Halloween in the classroom! My students are always working on fluency. I like to mix it up each month just to keep them interested. This month it's all about costumes, candy, and spooky animals! They love theses centers! They got so excited when they saw the new Halloween theme out this week! This unit includes everything you need for five different fluency centers. 1.) Pocket chart reading cards with "unique voice" cards so they can practice using different intonation while they read the cards. Your students can be a ghost, a witch, a cowboy. There are several "voices" for them to choose from. Fun pointers and spy glasses are included to help them track their reading too! 2.) The roll a phrase game is perfect for playing with a partner, or in a small group. It's a fun way to add some movement into your fluency practice! Players read phrases to collect cards. They can lose cards too depending on what number they roll on the dice. The player with the most cards in the end wins! 3. )The reading passages are leveled and numbered for timed reading. There is a chart to graph words read and track improvement over five reads. Five different stories are included. 4. 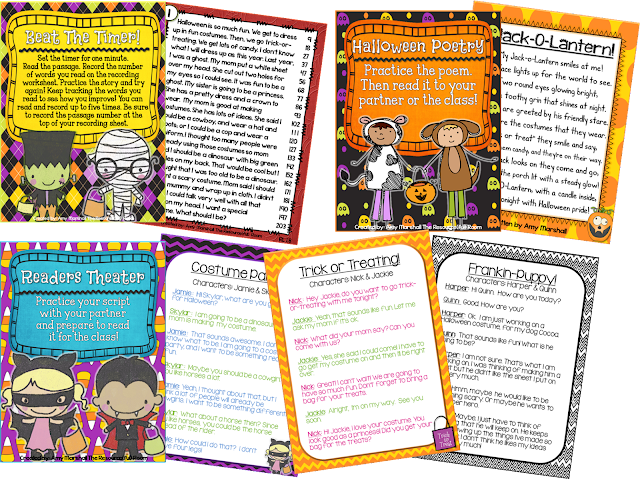 )The poetry center includes five original poems as well as activity sheets for extended practice with rhyming words, synonyms, and word choice. 5.) Five readers theaters designed to be read with a partner help students take on the voice of a character. My students love reading these to the entire class when they have practiced them and can read them well. Each of these centers can be printed in color or black and white! 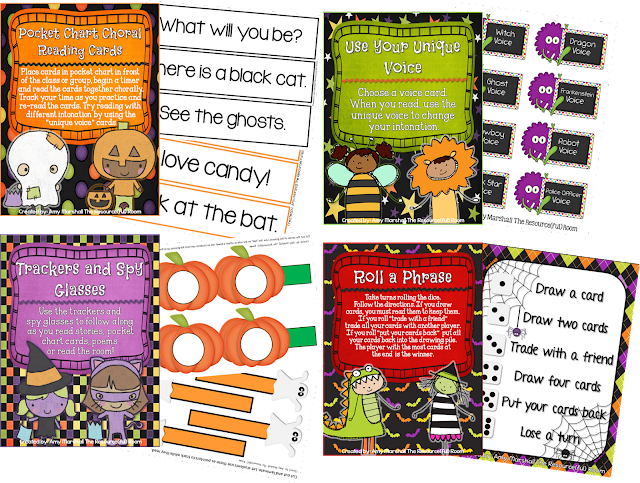 If your students need a little practice with fluency, and you celebrate Halloween, this is the perfect unit for your class! You can come on over to my TPT store and check it out! 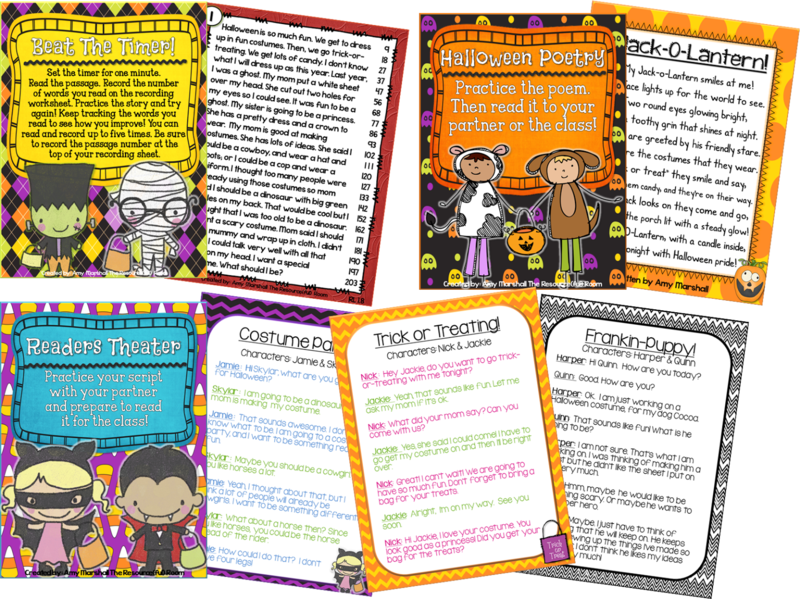 Be sure to come back tomorrow through October 25th to see more great fall products featured by great teacher authors! Happy Fall!! Amy, This looks INCREDIBLE and jam-packed with fun!! !